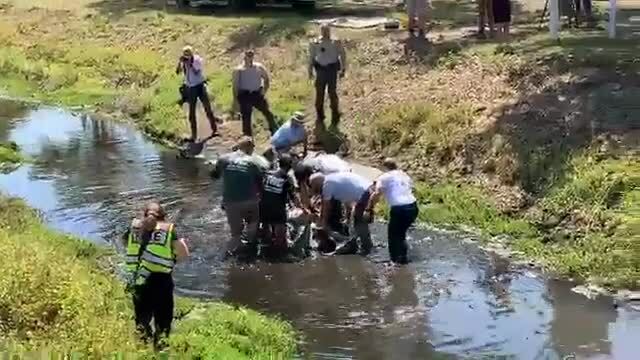 South Trail Fire Rescue and Florida Fish and Wildlife responded to rescue a manatee that was stranded in a canal in Fort Myers. 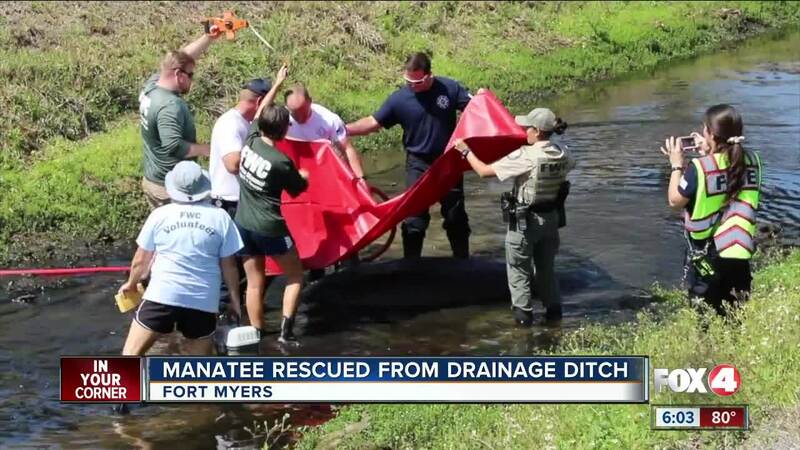 FORT MYERS, Fla. -- Authorities were working to rescue a manatee found struggling in a shallow drainage ditch off Summerlin Road Monday morning. It was happening along Brantley Road, just north of College Parkway. South Trail Fire Rescue and Florida Fish and Wildlife responded to assist the marine mammal. The ditch connects to a waterway off the Caloosahatchee River in the Whiskey Creek area. FWC says this was an 8-foot 500-pound manatee, so it was all hands on deck. Wes Weigel, who's visiting the area on vacation says he couldn't believe his eyes when he was taking his morning walk. "We all took a closer look and all of a sudden you see the fin and I go oh my god that’s a manatee," Weigel said. Weigel quickly called 911 around 9:30 a.m. FWC quickly rushed over, to soak the manatee with more water, to keep his body cool. FWC says they believe due to the rain showers early Monday morning, it caused the water to raise and the manatee took a wrong turn down the drainage canal. After several attempts to get him out of the water and up a steep hill, they finally managed to get him to a truck, where they filled an inflatable pool up with water. “What we want to see is to get the manatee out, get a good assessment on it so we can hopefully get it back and released to the wild,” said Major Roger Young of FWC. FWC officials tell Fox 4 the manatee was released in the Caloosahatchee River shortly after he was rescued.